Hanoi (VNA) - Vietnam may not reach this year’s targeted cashew export value of 3.3 billion USD, due to a shortage of raw materials for cashew export processing. Ta Quang Huyen, vice chairman of the Vietnam Cashew Association and general director of the Hoang Son I Co Ltd, stated that Vietnam’s cashew exports in the first seven months of this year have reached a total value of 2.6 billion USD. The domestic cashew industry must import about 300,000 tonnes of raw materials for export processing, to reach its targeted export value of 3.3 billion USD for the entire year, Huyen added. However, the cashew crop season in West Africa has already ended so the available supply of raw materials from this region will not be too significant, making it difficult for the domestic cashew processing industry, he further said. 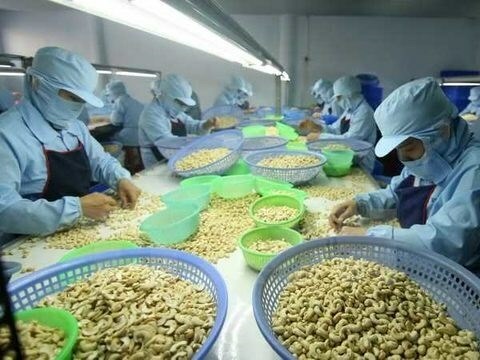 “In the first seven months of this year, Vietnam’s cashew processing and export enterprises have imported 1.3 million tonnes of raw cashew nuts, 200,000 tonnes higher than in the same period last year,” said Nguyen Hue Chi Thai, a consulting expert at the association. By the end of the year, the demand for cashew nuts in the world market will increase, especially for Christmas. Therefore, factories will continue to import 300,000 tonnes of raw cashew for processing and export to many countries, such as Libya, Mozambique, Tanzania and Indonesia. However, due to unusual weather conditions, many African cashew growing countries, such as Libya, have reduced their cashew output by 250,000 tonnes, so the two main regional suppliers of raw materials for the industry are Tanzania and Mozambique.